I have been careening from one class to the next, working on projects in between. Doing a tremendous amount of writing. Teaching a hastily organized online course on decimals. You know, as one does. And then last night it occurred to me that I really should look more than a day or so ahead. I have some work to do. This will be fun, though. If you find yourself in any of the following locations at the right time, do stop by and say ‘Hi’. Louisville, KY. NCTM Midwest Regional. November 7, 2013. Session 52: Standards for Mathematical Practice: They’re Not Just for Students Anymore! 1. (Almost) Everything Secondary Teachers Need to Know about Elementary Mathematics. 2. Practicing the Five Practices. Wausau, WI. Wisconsin Math Council “Math Proficiency for Every Student” Conference. December 13, 2013. (Almost) Everything Secondary Teachers Need to Know about Elementary Mathematics. Augusta, ME. ATOMIM Spring Conference. April 3 and 4, 2014. Various sessions. Duluth, MN. Minnesota Council of Teachers of Mathematics Spring Conference. May 2 and 3, 2014. Various sessions. Connected Mathematics–a 6th through 8th grade mathematics curriculum-is designed with a teaching model in mind: Launch-Explore-Summary. In my professional development work, I help teachers to understand the teaching model in general, and I demonstrate effective techniques for particular problems. For a few summers now, I have been demonstrating a Launch for a problem in the 8th grade unit Frogs, Fleas and Painted Cubes. I came up with the idea after leaving the middle school classroom, so I have not used it with students. But every summer, teachers ask where they can find written instructions for it and I have had to say that they do not exist. My summer teaching partner has reported to me that it has been effective in her classroom, so I am now motivated to write it up and share it widely. In what follows, I will assume that the reader has access to the Student and Teacher Editions of the unit. The problem in question is Problem 2.1 of Frogs, Fleas and Painted Cubes. In the original problem, students consider the effects of a land swap in which a square piece of land is swapped for a rectangular one with the same perimeter. So a 5 unit by 5 unit square, might be swapped for a 3 unit by 7 unit one. Students record their information in a table and look for a pattern in the relationship between the areas of the two pieces of land. In designing my alternate launch, I wanted to achieve two ends: (1) increasing access for visual learners, and (2) increasing the generality of the results. (1) was important to me because I have been working in my own teaching on visual representation in mathematics, and because the problem asks us to represent something geometric in a table. It seemed like a natural place to increase the visual components of the problem. (2) is important as a teaching principle. The original problem asks students to consider a variety of squares, but to always change each dimension of the square by 2 units. Thus a 5 by 5 square becomes 3 by 7, and a 6 by 6 square becomes 4 by 8. But there is nothing special about 2 units. A more general pattern emerges if we consider different numbers of units. For this problem, students will work in groups of 3 or 4. Each group receives a bunch of colored (say pink) inch grid paper and a bunch of white inch grid paper. After setting up the context as in the Student and Teacher Editions, have each student draw a square (with whole number side lengths) on a sheet of the white grid paper. Students should coordinate to make sure that each student has a square of a different size from their groupmates. Each group is assigned a number from 1 to 6, repeating numbers if there are more than 6 groups. 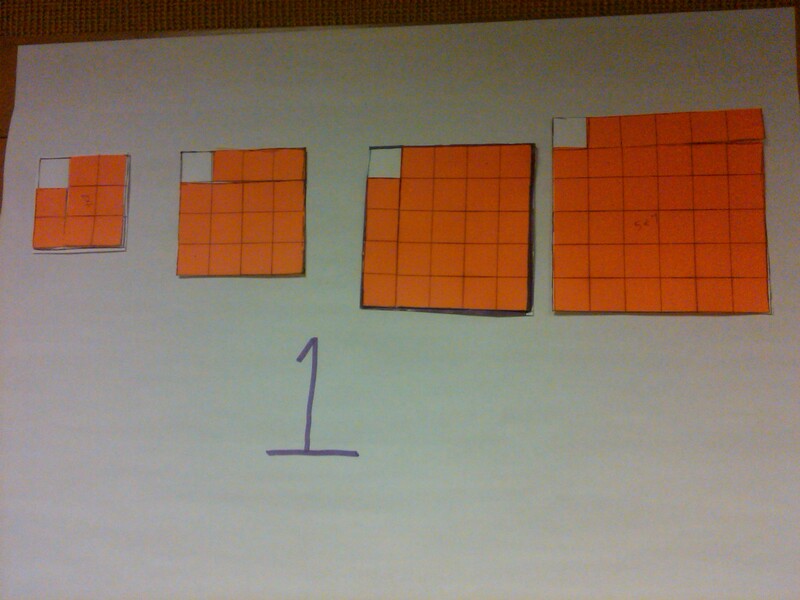 Using the pink grid paper and the group’s assigned number, each student draws a new rectangle. Say my group’s assigned number is 3. Then I will transform my original square (say it was a 5 by 5 square) into a new rectangle by increasing one dimension by and decreasing the other by 3. My new rectangle would be 2 by 8. This preserves the perimeter. What does it do to the area? To investigate this question, each student tries to cover his/her original white square with his/her pink rectangle. Students will need to cut these pink rectangles apart in order to cover as much as possible of the white square. 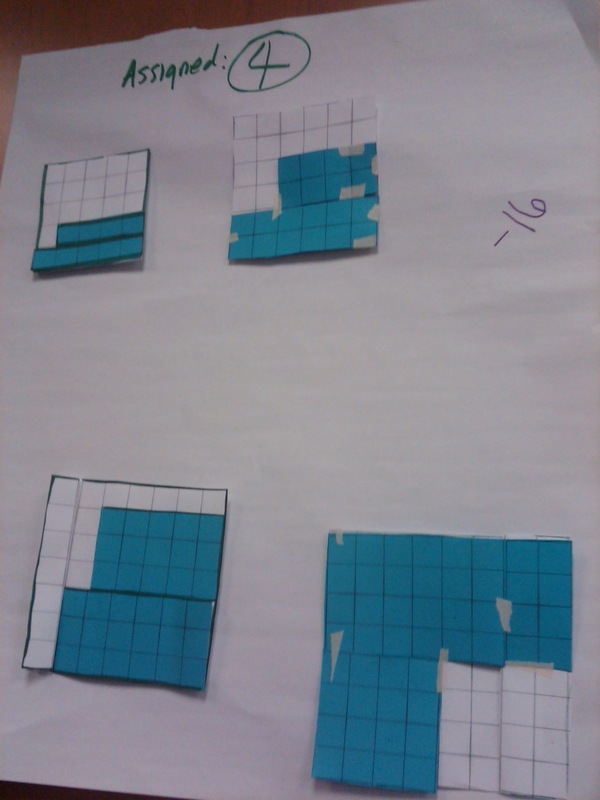 Then each group puts their covered squares onto a large poster paper and these are displayed around the room, in order of the assigned numbers (see below). It does not matter what size square we start with; the difference between the area of the original square and the area of the pink rectangle is the same within each group. The group’s assigned number matters-as the assigned number increases, so does the difference between the areas of the original square and the pink rectangle. The area of the pink rectangle is always less than the area of the original square. We can see this because we never quite cover the white with the pink. Several of these images show a white square peeking out from behind the pink. Is it always possible to rearrange the pink so that a white square peeks out from behind? 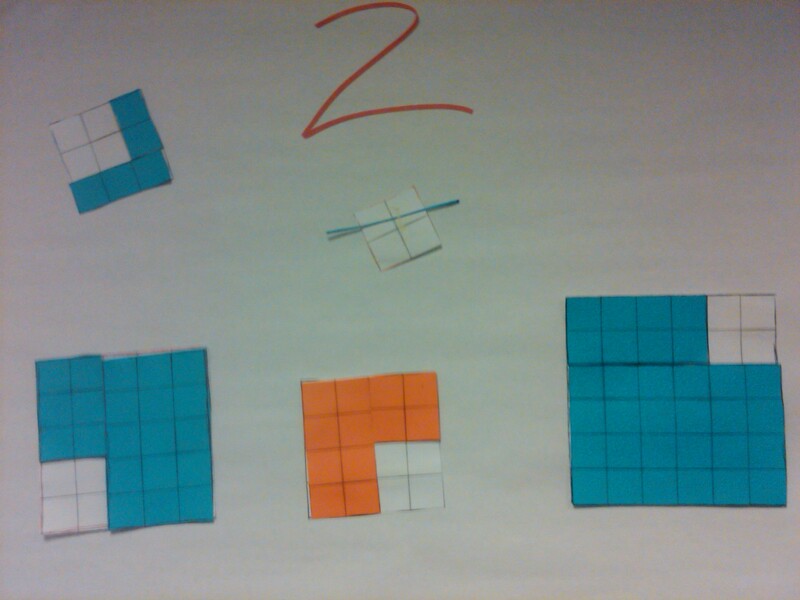 When will it be possible to arrange the pink so that it is in the shape of a square (with whole-number side lengths)? After some work observing patterns and asking questions, now students should be ready to make the table in the text. However, students should alter the table to match their group’s assigned number, and they should conjecture how the tables of groups with other assigned numbers should look. How many degrees in a polygon? I nearly always learn new mathematics when I work with teachers. 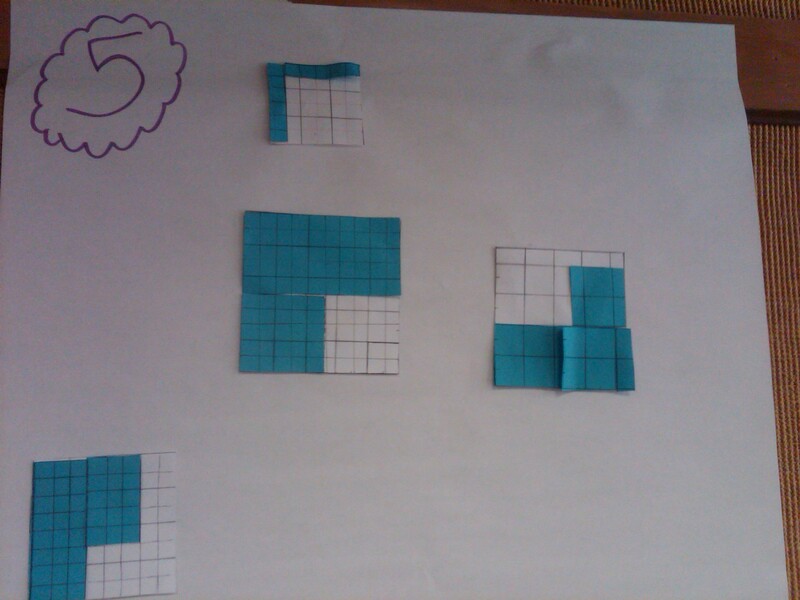 Recently I led a daylong session on the Connected Mathematics unit Shapes and Designs with a group of sixth-grade teachers. In that unit, there is a problem that asks students to figure out the total number of degrees in the interior angles of an n-sided polygon. Most of the teachers in my session knew the formula T=(n-2)*180 where T is the total number of degrees in all interior angles of the polygon and n is the number of sides of the polygon. But it quickly became clear that they were struggling to use the diagrams to justify the formula. As a group, they liked Tia’s diagram because it shows (n-2) triangles, but they could not answer my questions about why Tia gets (n-2) triangles when she cuts up an n-sided polygon. Furthermore, they tended to see Cody’s strategy as incorrect because he gets n triangles, not (n-2). We spent 45 minutes sorting this out as a large group. I pushed them to explain to me why Tia will get (n-2) triangles. And at the end I had four ways of understanding this. Three of them were new to me. This is the way I have always thought about the formula. In this way of thinking, each side of the polygon corresponds to one triangle in the dissected polygon, as in the shaded triangle below. The remaining sides of the shaded triangle are formed by the diagonals that Tia draws. Relating sides of the polygon to the number of triangles. But there are two sides that do not get used this way. The sides adjacent to the vertex from which Tia draws her diagonals are incorporated into the first and last triangles. Therefore, we always get two triangles fewer than the number of sides of the polygon. So (n-2) refers to the number of sides of the polygon. The remaining strategies were new to me. I have fleshed out the details of the arguments the teachers made. Tia draws diagonals from one vertex (call it A) in order to form her triangles. In doing so, she draws (n-3) diagonals. Those diagonals cut the angle at A into (n-2) parts. At the other end of each diagonal (at C, D and E in the diagram below) the angles of the polygon are cut into 2 parts. There are two angles that remain intact. In forming her triangles, Tia get (n-2)+2(n-3)+2 angles in all of the triangles combined. This expression simplifies to 3n-6. Each triangle has three angles so the polygon has been cut into (3n-6)/3=(n-2) triangles. In this argument, n stands for the number of vertices in the original polygon. Of course this is the same as the number of sides, but the argument focuses on the vertices rather than on the sides. A simpler way to use vertices is to notice that from vertex A we can draw (n-3) diagonals. This is because we draw a diagonal to each vertex except A and the two vertices adjacent to A. Just as cutting a cake 1 gives 2 pieces, cutting our polygon n-3 times gives one piece more: (n-3)+1=n-2. So (n-3) diagonals make (n-2) triangles. These vertex arguments were interesting for me to consider. I had always thought about n in the formula as the number of sides. More profound for me was a teacher’s observation that Cody’s strategy can be connected to Tia’s. In this case, n refers to triangles, not to sides or vertices. Cody’s strategy involves putting a new point in the interior of the polygon. Connecting that point to each of the vertices gives n triangles. But when we total the measures of the angles of these triangles, we are including the angles in the center of the polygon and these angles really have nothing to do with the angles of the polygon. So we need to subtract their combined measure from the total. These extra angles completely surround the center point so they total 360 degrees. Therefore Cody’s formula is n*180-360, which is equivalent to (n-2)*180. A teacher in my session observed that this new point could be anywhere in the polygon. Furthermore, if we pull that point towards a vertex of the polygon, two of Cody’s triangles get smaller and smaller in area. When the point is pulled all the way to a vertex, those triangles collapse and disappear, and the extra 360 degrees around the point disappears at the same time. So Tia’s strategy is the same as Cody’s strategy except that she has chosen her point to coincide with a vertex of the polygon. (n-2) refers to n triangles that Cody would draw minus the collapsed triangles. Click here to view a brief animation demonstrating this strategy. Following this teacher’s logic, I wondered what would happen if we dragged the point to the side of the polygon instead of to a vertex. I turns out that only one of the triangles collapses, and the extra point now has 180 degrees surrounding it. This leads to a new formula: (n-1)*180-180. Click here to view a brief animation demonstrating this strategy. Readers are invited to submit further ways of thinking about the number of degrees in the interior angles of a polygon. Don’t worry about the art-describe your thinking in detail and I can draw the picture for you! I have written a Sophia packet on angle measures in polygons-considering the general case of the argument involving exterior angles of a polygon. If you’re looking for more information on this topic, the packet is worth checking out.